Expressing deep concerns over last week's renewed violence in the Central African Republic (CAR) that has reportedly claimed dozens of lives and displaced more than 11,000 persons – many civilians – United Nations Secretary-General has called on the armed groups to immediately and to “genuinely” commit to peace. 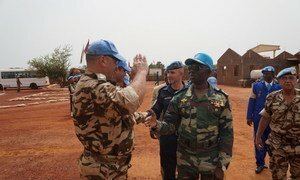 He also recalled the willingness of the international community, expressed at the recent Brussels conference on the country, to support CAR on its path towards recovery and stability. “For this to happen it is important that the right circumstances prevail,” the statement added. Two factions of the ex-Séléka armed group – the Front populaire pour la renaissance de la Centrafrique (FPRC) and the Union pour la paix en Centrafrique (UPC) – clashed in Bria, Haute Kotto prefecture and many of the victims were reportedly civilians. A large number were ostensibly targeted because of their ethnicity. In the statement, the UN chief also expressed hope that the upcoming extraordinary summit meeting of Heads of State of the Economic Community of Central African States, expected to be held in Gabon's capital, Libreville, on 30 November, will reinforce the efforts undertaken by the Government of the CAR and President Touadéra to consolidate peace and place the country on a path of recovery and stability.